The Pan Focus 18mm f/2.8 is the 2nd smallest Pentax Auto 110 lenses and it is just as tiny as the 24mm. Its filter size is 30.5mm while the 24mm is smallest with filter size in 25.5mm. 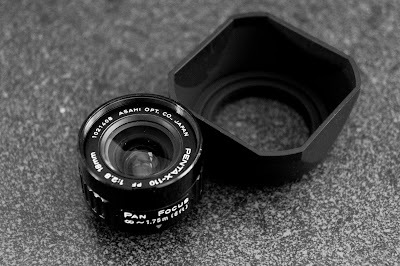 The pan focus likely shares similar optic design to the regular Pentax 110 18mm f/2.8. However, there is one major difference in the Pan Focus lens not having any focus ring. It has subject in focus from about 1.75m or 6 feet to infinity. I see it as a great street shooting which allows one to focus in framing and snap scenes into focus from 6 feet to far away. One can use this rare lens as a quick shooter with Sony NEX 5N. I used it for night scenes testing. It is not a fair test as I don't have a lens hood mounted and I shoot all photos in Jpg and high ISO in 3200, and without a tripod. I tried to run the lens through the toughest scenes. I have a Rolleiflex/Yashica 30.5mm snap on plastic hood but it won't fit the screw mount on the Pan Focus lens. I will report next how I go about getting good lens hood to for the Pan focus and the 24mm. Very easy to use as there is no focusing involved. Did you find a sollution for the lenshood? Thanks! Great posts!